I start off questioning the value of blogging an event that you know in advance will be blogged to death from every side. Does it really help anyone to have multiple perspectives on one thing, when the inevitable inconsistencies between them may be confusing? And if there are six accounts already, what added value is there in a seventh? originally uploaded by Terry Freedman. And then the penny drops, and I realise how to answer my question: I'm not doing this just for your benefit, dear reader, I'm doing it for mine. It's a means of consolidating my reflections. I leave them on my doorstep, and if you pass by and find them interesting, so much the better. But I'm under no obligation. Did you think I was aiming to be 'customer-centred'? Pay me some money, become a customer, and I might be. Until then, if there's no value in this for you, well, you can have a refund. For blogs to have an authentic voice, people have to speak first as citizens, not try and fit what they say into customer/supplier roles. All of which is a lengthy preamble to a few comments I wasn't expecting to make on yesterday's blog.ac.uk conference. Take a look at this photo to see the array of laptops at the event. And almost enough digital cameras flashing to create a strobe effect. Just 24 hours after the event finished, here are Flickr sets of the event from Ewan McIntosh, Peter Ford and Stuart Yeates. Expect more here. Blog entries so far from Miles Berry, Peter Ford, Stephen Powell, keynote speaker Barbara Ganley, and an amazing ten posts from Ewan McIntosh. I took neither a laptop or a camera, just a Palm and a pencil. 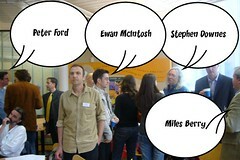 I didn't know of the blogs of the 'famous blogerati' identified in the photo above, apart from Stephen Downes'. But perhaps my greatest, and certainly my most unexpected, pleasure was meeting Alistair Fitchett, who's also in the photo (though partly obscured) between Stephen Downes and Miles Berry. I knew little of Alistair's day job as a teacher, but I've been enjoying his Tangents webzine of 'unpopular culture' for six years, and we've traded CD-Rs and MiniDiscs by post without ever speaking. The Tangents site is full of beautiful, beautiful writing about music, and articles there have led directly to me buying albums by Aislers Set, Russian Futurists and July Skies. In one case, it must be said, I enjoyed the writing more than the album it praised. Alistair and I talked briefly about how Tangents maintains such a high quality of contributions — including from well-respected journalists like Everett True — while not being able to pay anyone. 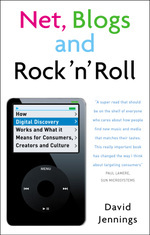 I'm going to cover some of the workings of this anti-commercial economy of high quality music recommendations in my book. Serendipity and small worlds are important ingredients in informal learning. … If you're still here, Barbara cited a claim that there is a deepening divide between what learners need and what education system will allow, that the system is concerned with control, when it should be more fluid and more encouraging of sharing. She spoke about how the institutional framework of education generated responses from students fitting of people who had been institutionalised. Their work in preparation for tests is dull and safe. But we know that, outside the classroom, young students are indulging in all sorts of experimentation — not all of it 'safe' — which has a profound effect on their maturing identities. Barbara's encouragement of student blogs aims to capture some of that experimentation, or at least bring it back into the learning process. Barbara seems to be aiming to re-cast the habits of student-teacher interaction. Email is a tool to communicate with the Establishment, she says, so students don't check their accounts; and when they do, they don't adopt proper etiquette. So Barbara gives her students blogs, and she blogs alongside them. As a matter of principle, she refrains from posting comments on their blogs (though she will give them feedback privately to let them know she's reading them). For her to post comments would be to reinstate herself in a position of authority such that her comments had higher status than peers'. She doesn't want to do that. "I have left the teaching stage" (that's 'stage' as in theatre), she says. Then my notes say "click, clack, chattering teeth, sub-vocalisation": my attempt to describe the sound of a room full of bloggers typing their thoughts on what they're hearing, under their breath, so to speak. Stephen Downes' main theme is blog literacy, treated as a specific instance of wider cultural literacy. No child sets out with the aim of being able to read and write, he points out. They set out trying to do something else, and have to read and write to accomplish it. So literacy and learning is accomplished by accident while you're doing something else. His broad definition of literacy principally concerns enculturation, and extends to the kind of literacy you need to cross the road quickly and safely (visiting a country where the traffic signals and highway etiquette are different, and where they drive on the other side of the road, brings home how non-trivial this is). Literacy is being so embedded in a culture that you can "fill in the blanks" — you don't need others to spell things out for you chapter and verse. Then maybe my attention wandered, because I don't see the obvious connection between this and the next quote in my notes: the admirably anarchist, "We have to wonder sometimes whether control is necessary to achieve the desired outcome or whether control is the desired outcome." In education, Stephen says, the latter seems to be the case. So how does blogging change this? People don't want to live in the long tail: they want to be read and heard. But we are not the change, we are not the revolution. Stephen believes that it's the generation after us, our students, who will be the revolution. Ewan McIntosh notes that Ben Hammersley would disagree on this point. So, I imagine, would Jay Cross, who believes that the pace of change is itself accelerating and the paradigm shift rate is doubling every decade. I think I'm in the opposite corner, as recently articulated by Tom Coates in relation to media technologies. I don't see the evidence of revolution now or in the foreseeable future. Every generation wants to believe that "the really important stuff" happens when they're alive. It's an egocentric belief. It's what helps millenarian cults and management visionaries prey on gullible people. But patently it can't be true of every generation. Yes, things are changing. Significantly, but often incrementally. Some change may be non-linear, but a few people don't appear to realise that there are plenty of ways of being non-linear that don't involve exponential growth and "hockey stick" curves. (The weather is non-linear: sometimes it flips into massive change, but much more often it cycles through very modest change.) Have more paradigms shifted in the last forty years (my lifetime) than in the forty years before that? I don't know how you'd measure the internet against nuclear weapons, or building the Berlin Wall against knocking it down, but my impression is that change had been pretty steady in the developed world recently. The biggest threat to life and limb is still the internal combustion engine, as it has been for a few generations. But Stephen Downes didn't talk about that. He did, however, seem to reject institutional solutions to some of the dilemmas (such as racist or otherwise offensive language) of blogging. "Being a good blogger, and a good citizen, cannot be captured in a code of practice."